High School members of SADD. 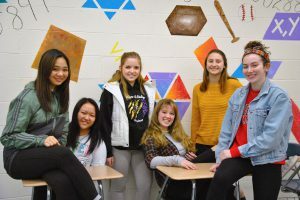 Of six students gathered for a recent meeting of Students Against Destructive Decisions (SADD), four are close to someone whose life has been affected by substance abuse. They know it’s a problem in their community, and among their peers. They wish adults would acknowledge it and talk about it. They wish their peers would listen. SADD is primarily concerned with promoting smart decisions and positive behaviors. The club’s awareness and prevention efforts begin at the Middle School. 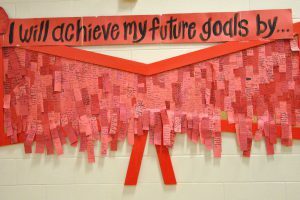 During Red Ribbon Week in October, SADD members set up shop in the school’s cafeteria and invited students to pledge to make smart decisions and achieve their future goals. The pledges were posted on a banner that now hangs in the cafeteria. This spring, SADD members will bring a “just say no” message to the middle schoolers during health classes. Banner created by SADD members and Middle School students during Red Ribbon Week. “I joined SADD because of what it stands for, and because I was aware of the prevalence of substance abuse,” said Anabel Field, a junior. She finds that her peers don’t take these issues seriously enough. According to Mr. Mark, while substance abuse and other destructive decisions are difficult subjects, mired in negativity, SADD is focused on engaging students in positive activities.